Work on the world's tallest effigy of Jesus Christ was completed in the small Polish town of Świebodzin at the weekend. 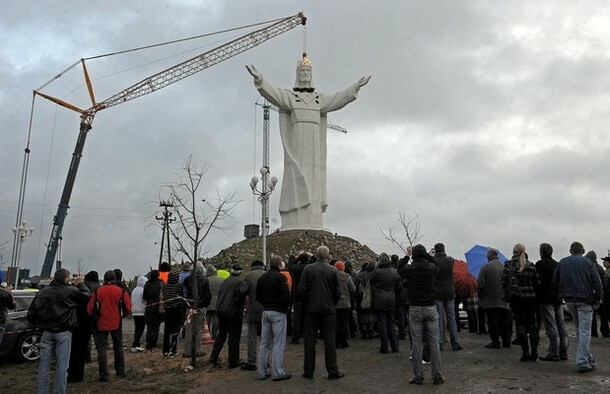 A giant 700-ton crane was specially drafted in to lift the figure's outstretched arms and crowned head into place. An earlier attempt some weeks earlier failed when a different crane was unable to lift the the plaster and fiber glass mass. The body of the finished statue measures 33-meters-tall, one meter for each year in Christ's life. A three-meter-tall crown and 16-meter-tall mound bring the figure's total height to 52 meters. The effigy overshadows Rio de Janeiro's Christ the Redeemer, which stands at 39.6 meters tall, and the Cristo de la Concordia in Cochabamba, Bolivia, which stands at 40.44 meters. The project has been the lifelong ambition of Father Sylwester Zawadzki who recovered from two heart attacks during the construction process to finally see his dream realized. “This is the culmination of my life's work as a priest. I felt inspired to fulfill Jesus' will, and today I give thanks to him for allowing me to fulfill his will,” Father Zawadzki, told onlookers and reporters. 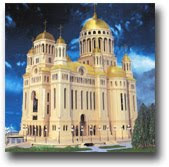 The statue will be officially consecrated on November 21.